Normally I would never go into a store and buy something I had no name for. Normally I would never buy more than one herb. Normally I would never buy an herb not in a little plastic package. Normally I would never buy more than two green veggies at once. Normally I would not buy lettuce and chard at the same time. Normally I would not buy five cucumbers in one year. Normally I would avoid dill. Normally I would not buy something I had never seen before without a recipe like a white eggplant. Normally I would not buy something I didn’t know how to cook. Ten ears of corn and one more (hidden) cucumber! Normally I would not buy ten ears of corn at once. Normally I would not buy something that needs to pickle. I guess I’m not normal anymore. That’s ok, I never want to go back. I’ll spare you both a link to the recipe and the final product. I am not a fan. I like spaghetti and acorn squash, but not patty pan, sadly. Hey, at least I tried. Big win? The cabbage I turned into the most delectable slaw. I’ll share the recipe later (I must go to sleep now). I’m loving my new relationship with produce. Light green thing = Kohlrabi? Have you tried to make ratatouille yet? It’s delicious & healthy. You would normally NOT buy ten ears of corn at once? Poor Mrs. Q. You’re supposed to buy corn by the dozen and eat an ear every day! Pictures look great though. Is it white or multi-colored? Y-U-M.
Kohlrabi is good raw or cooked. Peel thoroughly and shred for slaw, slice to put on salads, eat with dip, or cook like a potato. Yum! Yep – Kohlrabi. They are wonderful. They taste mostly like a slighty sweet broccoli stem. They are good thinly sliced with lemon, roasted, steamed. I can’t remember if you’ve talked about this site before… but a great place for info on fruit and veg is http://www.fruitsandveggiesmorematters.org/. They have nutritional information and tons of recipes for all sorts of veggies. Summer squash is tasty, but roasting it is probably not the best method for cooking it. If you’re willing to try it again, just slice it and saute in a hot pan with olive oil, a little butter, garlic and/or onion and salt and pepper. Don’t overcook it or it will get mushy. I use the same treatment for zucchini. 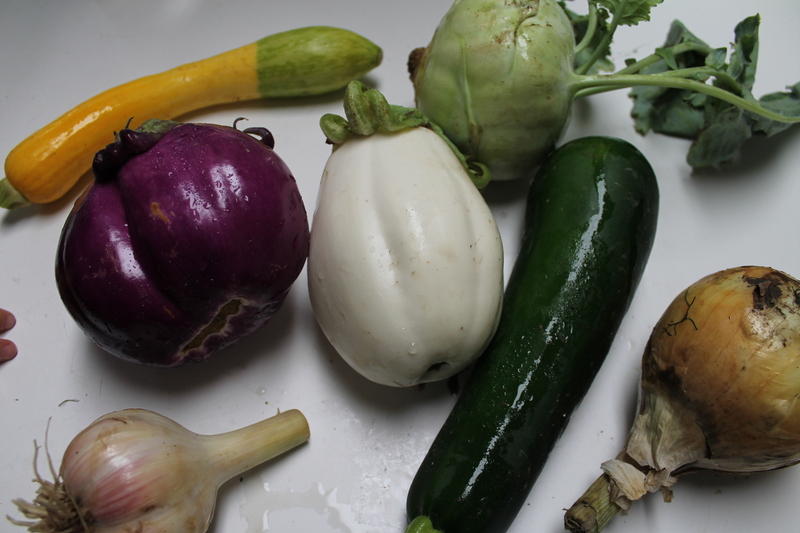 I’ve had little patty pan squashes before and they tasted just like courgette/zucchini to me. Try them in ratatouille or steamed with a bit of cheese melted on top! Man, I could eat a whole cucumber to myself as a snack. Cucumbers do not last in my house. Another thing I’ve seen done is garnishing water with cucumber slices. It adds a light refreshing taste. A local Lebanese restaurant I go to does that and I love it. We had a ton of corn a few weeks past and we made a black bean and corn burrito/enchilada filling that was quite delicious. Also corn chowder, as some commenters have suggested, sounds great. You can use the corn cobs to make a tasty broth for such a dish. I know this sounds sort of weird since you don’t know me…I’m just some internet person that has been reading your blog for a year or so now…but I’m really proud of you for breaking out of your comfort zone. I have been buying things at the farmer’s market that i don’t recognize and have had a lot great cooking experiences because of it (such as pea greens/tendrils, yum). At least with the internet it’s never been easier to to find a recipe with a specific ingredient. If all else fails you can just cut everything up and make sort of a stir fry. Good luck! You can substitute the white eggplant for purple eggplant in any recipe. It’s just a different color. My favorite way to eat summer squash (like pattypan) is to saute it in a skillet with onion and bacon. Yum, yum! But then I’m one of those people who thinks bacon makes everything better! You can also slice it thin, brush with a little olive oil, sprinkle w/salt and pepper and slap it on the grill. I’d be making a lot of cucumber salad if I were you – thin sliced onion, sour cream, a little vinegar, salt and pepper and sugar to taste. And throw some of that dill in too. Trim the silk that shows above the husk of the corn, and any very loose husk leaves, and put the corn otherwise untouched into a 400 – 450 f. oven for about an hour. Peel the husk and silk off the ears after it’s roasted (the silk will just slide off). Eat as much as you can of it at once with butter and salt. Then! Take the rest of the ears and scrape the kernels off them into freezer-safe containers and freeze the kernels. Every time you get more corn, add more kernels to your freezer collection. By the end of the summer, you should have lots of frozen fresh delicious corn to eat in winter. My kids love it when I slice up zucchini, yellow squash, onion, bell pepper and mushrooms and marinate with a good Italian dressing and throw them on the grill in a veggie basket. Give it a try and you may end up liking the yellow squash. Pattypan squish= olive oil, basil, onion, saute……. My 3 year old son had kohlrabi (the light green thing) for the first time last week and declared it, “Even better than celery!” (He loves celery.) I simply peeled it and sliced it. Good luck with all of your amazing looking veggies, as overwhelming as they may seem. Light green thing is definitely kohlrabi (it also comes in purple). When you get it home, snip off the leaves/stalks–the bulb is the good part. It has a thick peel–I usually go after that with a paring knife. You can use the heart of the bulb chopped up into coleslaw, sliced into salads for crunch, or I like to cut slightly thicker rounds and eat them spread with hummus. They’re very crunchy and have a taste somewhere between raw broccoli and mild cabbage. I never had tried it before joining my CSA last year, and now it’s one of my absolute favorites! Kohlrabi, peel, slice, enjoy. has a peppery flavor like cabbage or a very mellow radish. 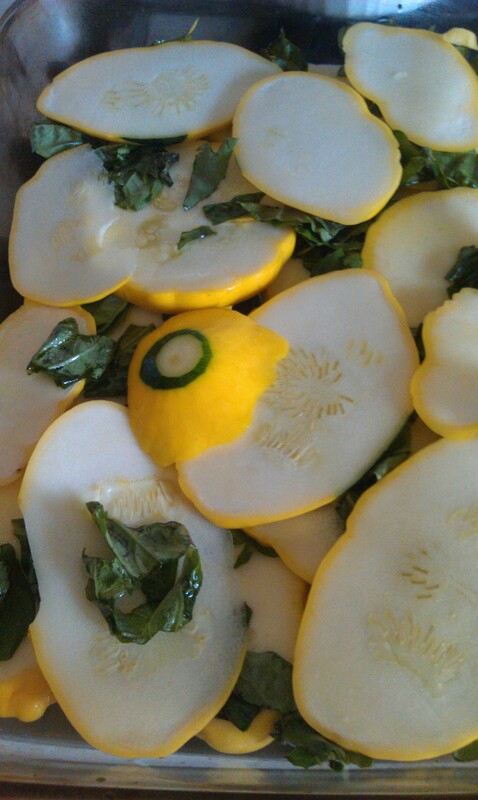 Mrs. Q, seeing the photo of that pattypan squash before it went into the oven, I’m not surprised you didn’t like it. The pan is way overcrowded with squash. It probably just steamed instead of roasting. Try it again (you could use that long green and yellow squash in this week’s CSA) and place the squash on the pan in a single layer with no overlap. I can barely see any olive oil on the squash. You might need to add a little more. Also sprinkle some salt on the squash to help draw the moisture out of the squash as it cooks. Then roast the squash until it’s lightly browned (salt I recommended will help with this). The bottom of the squash pieces (the side resting on the pan) will brown before the top so after 15 or 20 min., take a peak and stir the squash or turn over each piece with tongs or a fork. The flavor is in the brown part which is caramelized squash and tastes sweet. If you can manage to get it to caramelize, I really think you’ll love the way it tastes. Also, don’t add the fresh basil until after cooking the squash. Generally speaking, fresh herbs don’t hold up well to heat. Conversely, dried herbs generally do hold up well to heat and can be added before cooking. One exception to my fresh herb advice is my recommendation on a prior CSA box to put fresh whole sage leaves under the skin of chicken or other poultry prior to cooking. That works because the sage gets basted by fat from the skin as it cooks. To be honest, I don’t think basil pairs particularly well with summer squash (unless tomatoes are also present). With summer squash alone, I prefer thyme or oregano or marjoram or savory. But that’s just my personal preference. Others may have a different opinion. If you really get into roasting vegetables (I highly recommend it), it helps to have a couple of substantial baking sheets. I bought 2 really nice quality pans on the cheap at a restaurant supply store. What I bought are called half sheet pans (they also come in quarter sheet and full sheet but the full sheet doesn’t fit in many home ovens). My half sheet pans are huge and heavy and I definitely get better browning results with them than I ever did with the flimsy old “Baker’s Secret” ones I used to have. All the root vegetables you’ll soon start to get in your CSA boxes will be fabulous roasted so these pans are a good investment. If I have some produce that’s about to go bad, I roast it so that it remains edible a few days longer. Think tomatoes, asparagus, Brussels sprouts, cauliflower, eggplant (slice about 1/2 inch thick), garlic, onions, leeks, peppers (sweet or hot), carrots, potatoes and most other root vegetables, and probably many others I’m not thinking of at the moment. One nice thing about roasting vegetables, Mrs. Q, is that they can be cooking in the oven while you spend time with your son. I bet he’d even enjoy arranging the raw veggies on the pans for you. I have a fantastic recipe for a kohlrabi soup!!! It’s a very delicious vegetable!! Whenever we get stuff in our CSA that we have no idea what to do with, we throw it into a stir fry, add a little soy sauce, and serve it with brown rice. Easy, simple and usually delicious! Also, kolhrabi needs to be peeled before you eat it! But it definitely tastes like broccoli. Unless you absolutely hate dill, you can make pickles and dilly beans! It’s so easy. Place 3 cloves of crushed garlic, 4 peppercorns, and a handful of fresh dill in the bottom of a 1 qt. glass jar. Either stuff with fresh green beans or cucumbers. Cover with a brine of 1 1/2 T sea salt to 2 cups of water (bottled or filtered, not chlorinated). Cover the jar with a lid, and let it sit on your counter for 3 days. You will see lots of bubbles, and the liquid will get cloudy… that’s good! Then move it to the fridge. Lacto fermented foods rock! They are probiotic, and the vitamins and minerals are much more easily absorbed. It’s a highly nutritious food, and so yummy!!! Steamed corn is a favourite snack in my part of the world. Just cut the corn from the cob, steam and mix them with margarine and a bit of salt… Kids love this! You can cook pattypan squash just like zucchini. Just because you don’t like THAT recipe doesn’t mean there is NO recipe you’ll like. Half-cook a cup of brown rice, set aside. It should still be a bit crunchy because it’s going to FINISH cooking in a bit. Chop up a porkchop, start cooking it in a large pot. While it fries, grate or thin slice your pattypan. Or whatever summer squash you have. Also chop and onion and press two, three cloves of garlic. Add the onion and garlic to the pork, and a little olive oil. When just soft, add the squash. Chop up a green bell pepper (optional: and half a red and/or yellow one, or any other color you like), add it. Add a can of crushed tomatoes (optional: and one or two fresh chopped ones OR some spinach puree) and the rice. Cover and let the rice finish cooking. When the rice is just about done, open it up, add some chili powder, some smoked paprika (can we say yum??? ), salt to taste. Chop up some mozzarella (buffalo mozzarella is the best if you can get it), add it in, stir slightly and let it melt. As for the cucumbers, they’re great in what we call “summer salad” here. Thin cucumber slices, thin slices of tomato, scallions, and a little white vinegar and olive oil. Some salt and pepper, and optionally some thin ham. Delish. Sometimes, if I’m cooking Indian food I swap out lime juice for the vinegar and add some thawed frozen corn kernals. Oh, oh, you know what? You can use that pattypan (or ANY summer squash) to make pizza crust! You’re gluten free, right? The recipe does call for a little flour, but you can use rice or quinoa flour in place of wheat flour. All you need is a little something to bind it together. 2. Steam and food process into a sauce and add to (gf) mac and cheese. Replace 1/2 the cheese sauce with the squash. Best done with a yellow colored squash so it looks like cheese! I made this a couple weeks ago because I had some neighbors who were desperately trying to get rid of their patty pan. These are FANTASTIC! My husband hates veggies and he had a couple! 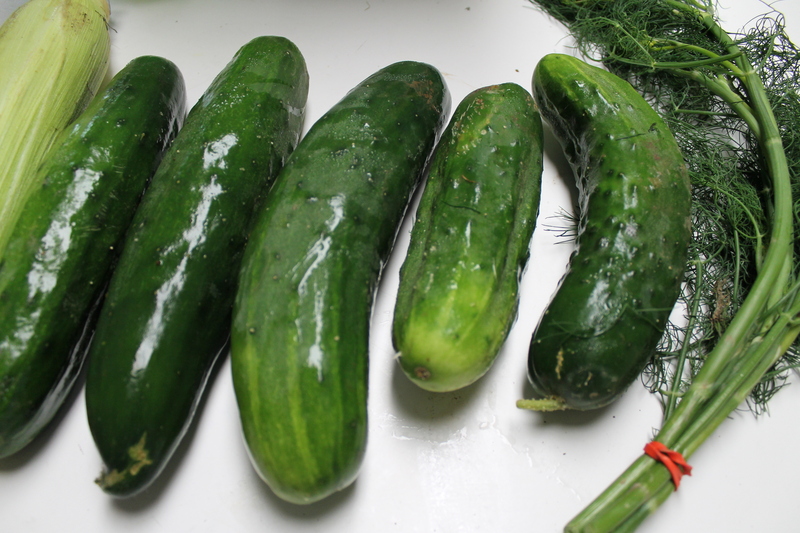 If I had that box with fresh cucumbers, garlic, and dill I would make the most amazing and easy pickles ever! dill. Add somewhere around 1/4 or 1/3 C of salt. the water and add fresh and that will keep it from getting too salty. They’re ready to eat after about 12-20 hours. Kolhrabi makes the most delicious “hash browns” ever!!! Get the skin off w/ a paring knife. Then slice into matchstick size pieces. Also dice a slice or two of vidalia onion (depending on how much you like onion). Melt butter in a pan, add onion, let it get soft. Add kolhrabi, stir to coat all pieces with the butter. Saute on med-high for 3-5mins to get a crisp on everything (just like hashbrowns in a diner). Then turn heat to low-med and cover with a lid for up to 10mins to fully soften & cook through everything. Once done, add ribbons of basil to the pan, stir to get the flavor throughout. Serve & season w/ salt/peper if you like, even my non-basil eaters enjoy the flavor of this dish! There is no such thing as too much corn in my house, but if you won’t eat all of it you can freeze it and have it in the winter when the garden is not producing. 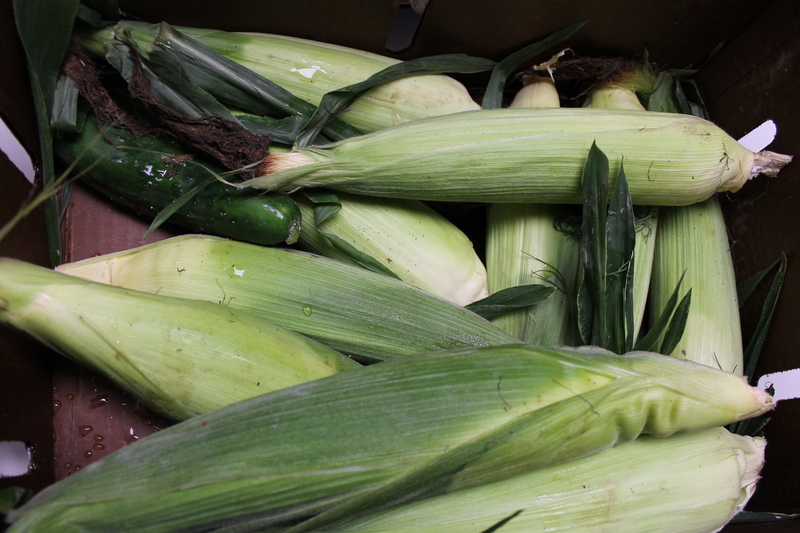 Shuck the corn and cook on the grill. You’ll have some dark areas, but great to cut off the ear and use in Mexican recipes (or freeze in containers.) Kohlrabi is nice and crunchy. Peel and eat! Make zatziki sauce and have some yummy greek gyros with some of the cucumbers. Dip the rest in hummus. As for the squash, try cutting into bitesized pieces and sauteing with olive oil and garlic as a side dish. We love it! Enjoy all your veggies! Patty pan squash isn’t meant to be eaten. It has very little flavor. It’s better used as a house decorator. My grandmother skins the LIGHT GREEN THING (kohlrabi), cuts it, and makes soup with it. I haven’t tried this with patty pan but with zucchini — we had it this way in Italy. Slice it super thin and eat it raw. Douse it in olive oil and some good cheese — grated peccorino or parmasean and salt and pepper. Our CSA is weekly. Do the veggies go bad after having them two weeks? You can also eat the corn raw. I cut the corn off the cob with a knife (just take the knife and cut vertically down the cob). I cut up some tomatoes from the garden and again, just olive oil, salt and pepper. You could also freeze the corn after cutting it off the cob and dry the dill and basil if you can’t use it now. Patty pan squash(had no idea that name, I know them as starburst) are great boiled whole until just soft enough to cut the tops off, hollow out the inside, mix insides with whatever (my favorite is whole wheat bread crumbs, cheese, bacon, and sauteed onion), stuff innards 🙂 back into squash ‘shell’, bake at 350 till brown on top!!! You won’t be disappointed!